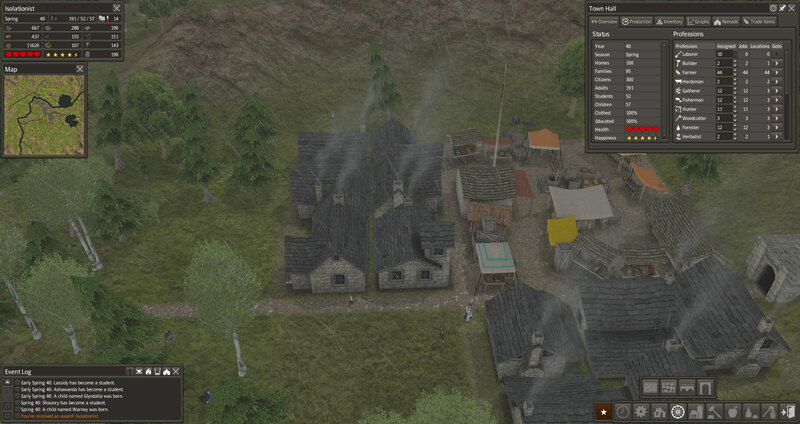 Lately I’ve been playing good old Banished again when I’m not doing something in Trove. In particular, I’m chasing after achievements in the game. I’m not usually someone who cares about achievements but I like the way they’re done in Banished. Some of them are ones that you’ll just get in the process of playing (ex. reaching a population of 300) while others pose a little challenge/goal for you in what is otherwise a sandbox game. There are four in particular that pose rather unique challenges, the first of which being Mountain Men which I actually completed back in March 2014. The requirement was “Using a harsh climate and a small mountainous map, maintain a population of 50 people for 20 years.” When I picked up Banished again, I decided to try for another one of these challenges, Isolationist. This is probably one of the easier ones to complete simply by having the right starting conditions. I needed to start with sheep since there would be no other way to get wool (and thus make warm clothes eventually) so I rerolled maps until I started with some. Then it was just a matter of having enough hunting cabins for leather. It’s pretty easy to be self-sufficient even without a trader. Between the fish, venison, mutton, gathered food, 2 types of crops, and 2 types of orchards, there was quite a variety of food for my villagers to eat. Even with spreading out a bit to gather my own wood, stone, iron, and coal, my town didn’t take up that much room on the large map I generated. I knew that I really had to watch my population, especially at the beginning. I’ve had problems before where I’ve gotten into a lull and didn’t build new houses fast enough, which resulted in my older generation dying off and the younger folks suddenly having to struggle with managing all of the jobs and resources. You can usually get an influx of nomads to recuperate from this but without a trader, they won’t appear. Really, this means that a population of 300 coming from just 6 families must be ridiculously inbred. On the flipside, I had to make sure I didn’t expand too fast or I’d run out of food and people would start starving and dropping like flies. Then younger people would move into their vacant houses and start making babies, which require even more food…because they’re not terribly smart it seems. Either way, I managed to find that happy medium and my town grew nice and steadily. It only took a handful of game sessions before I hit 300 population and got the achievement. A baby named Warney is what put me over, and I would say that I’d name my first kid after him, but I don’t want kids and Warney is a silly name really. During this game, I decided to try making taverns work for me for once. In the past, I’ve always struggled with them making enough ale and usually end up just trading for it instead. But I think I’ve finally figured it out. 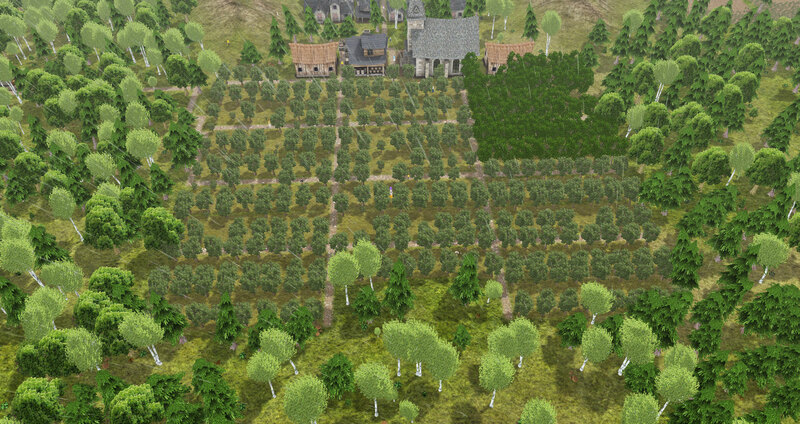 It involves making orchards…a lot of them. I’ve tried using wheat in the past but it’s not very efficient. 100 wheat makes 10 barrels of ale, while 60 berries or 30 of an orchard fruit (apples, cherries, plums, pears, and peaches) makes the same amount. Since no trader meant no new types of seeds, all I had to work with were plums and chestnuts. So I had so many plum orchards and a lot of plum ale. Ale does a surprisingly good job of keeping your people really happy. In setting this up, I found out that there’s an optimal way to set up your orchards. I already knew that the most efficient farm is 11×11, but it seems that for an orchard, it’s 15 tiles east-west by 4 tiles north-south. There’s a whole explanation on the Banished Info site as well as a handy calculator, which I would recommend checking out if you play Banished. There’s calculators for farms, pastures, and cemeteries too, although someone catching you looking at the cemetery one might think you’re a little creepy for doing so. So that’s why the orchards in the screenshot above are arranged as such. Now that that’s done, it’s time for the next achievement, which will be the harder One with Nature: reach 400 citizens without building crops fields, orchards, or pastures. I really do wish that using mods did not turn off achievements for the game. I realize that some of them are very game breaking but a lot of them introduce really useful changes and new buildings/items that keep in the spirit of the level of difficulty. Like mods that stop your villagers from burning your precious coal supply, a sawmill that increases your woodcutters’ efficiency but is harder to build, and smaller buildings that operate like markets but with a decreased range. 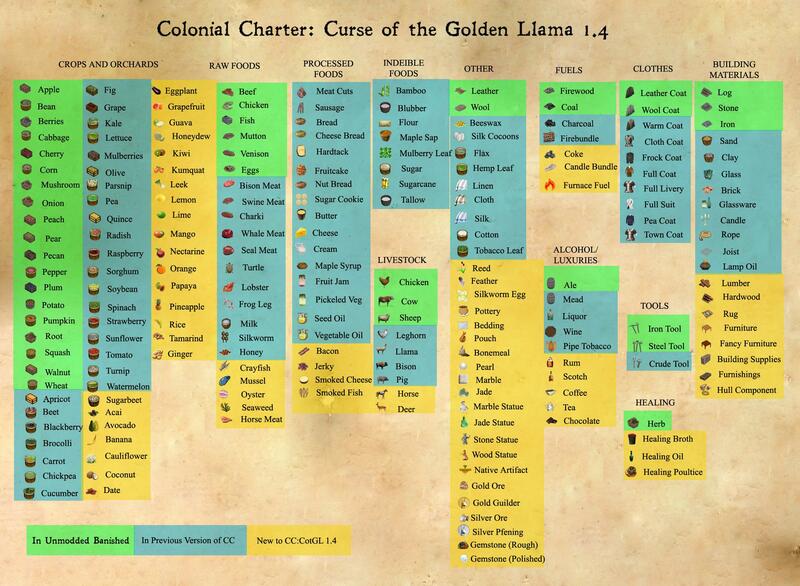 And llamas. Why can’t I get achievements with llamas?! I realize that unless the developer goes back into the code and determines what functions are or aren’t game breaking, I’ll just have to keep them off until I’ve gotten them all. Once that’s done, I’m thinking of trying out the Colonial Charter mega-mod because it adds so many cool new things that it’s like a free expansion. Seriously, just look at this chart. But first we shall see how my One with Nature achievement goes.